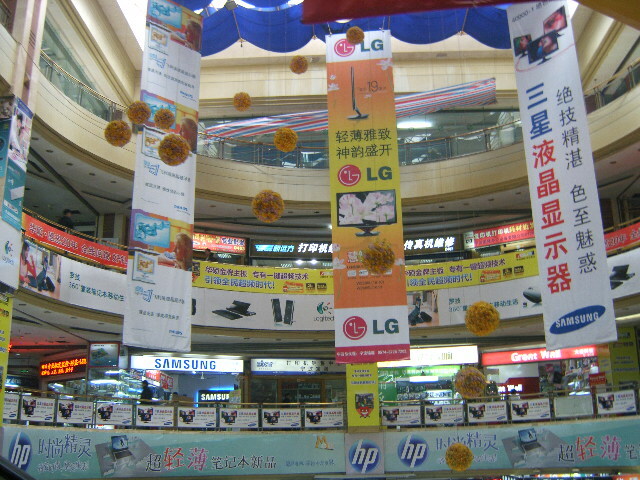 Mass consumerism in China has been caused by the rapid industrialisation of the country (Zehle, 2008). Economic growth leads to an increase in environmental impact (Alier, 2000). Electronic waste (e-waste) represents the biggest and fastest growing manufacturing waste in China (Chan and Ho, 2008). With the rapid development of technology, many people can afford to often buy and change basic electronic items. From a consumer perspective, people tend to think about value for money and functionality purposes before they buy electronic items, very few consumers and perhaps producers, take into consideration of the result of the environmental issues caused by the production and the dealing with electronic items. There is no direct definition of ‘e-waste’ because e-waste has different definitions to different people in different countries (Terazono et al, 2006). A 2nd hand electronic item for a person might be considered as e-waste for another person. The problem of defining ‘e-waste’ makes the enforcement of e-waste difficult to deal with (Wu, 2009). However, this essay defines ‘e-waste’ as any electronic items which have been used and the owners do not want to continue using them anymore. This could be due to broken parts items or changes in the consumers’ behaviour. Before 1996, many countries exported e-waste to China. E-waste has been a major problem in China as there has not been effective control in dealing with e-waste. According to Tong and Wang (2004), China has become the largest receiver of e-waste from the developed countries. The use of unskilled labour and inappropriate technology make it cheap for the country to get rid of e-waste (Tong and Wang, 2004, Terazono et al, 2006). However, since 1996, it has been illegal to import e-waste into China and this was implemented in order to manage the environmental impacts. E-waste from other developed countries could be 2nd hand products to China. Levin (2009) reported that Wang, a spokesman for the China National Resources Recycling Association said that the “Chinese tradition is all about saving and being thrifty”. They prefer to repair and refurbish e-waste before throwing them away. However, whether they could repair or reuse the e-waste or not, in the end, the items would still belong to China, which increases the quantity of e-waste in the country. Furthermore, some Chinese electronics repairers still choose to import e-waste from other countries in order for them to repair and reuse or resell them to local Chinese consumers. The visit to South Gate Market, Ningbo (Picture 1)enabled the Urban Media-Network students (09/10) to realise that there are many electronic items, especially televisions (Picture 2) lying around the market and it is assumed that they are unwanted electronic waste and are waiting to be recycled. This essay argues that importing of e-waste should be illegal in China. Part 2 explains why creative industries have been viewed as being irresponsible for e-waste. Part 3 looks at the reason why the importation of e-waste still exist in China though it has been illegal to do so. Part 4 evaluates the consequences of importing e-waste into China. Part 5 concludes that the importation of e-waste should be illegal in China unless the Chinese government can regulate the e-waste industry and control the impacts of dealing with e-waste have on the environment and people. This part includes relevant solutions and problems in order to maintain or reduce the amount of e-waste in China. Creative industries are irresponsible for their creative products. According the Creative Economy Report (2008), the United Kingdom Department of Culture, Media and Sport (DCMS, 2001, 11) proposed that creative industries are industries which require “creativity, skill and talent which has the potential for wealth and job creation through the exploitation of their intellectual property”. Examples of creative products include electronic items such as IPODS, IPHONES, televisions, printers and laptops. The main objective for most electronic companies is to launch advanced products, with modern designs, containing high speed technologies and high resolutions. Few companies pay attention to what happens to the previous products that consumers bought from them. Many companies think that as long as they can make profit, gain customer satisfaction and create brand reputation in the market place, they will launch the products. Consumers have low environmental awareness on electronic production and e-waste recycling (Meng, 2009). The interviews with electronic consumers that were done for this research (2010), found out that the main factor which influences the consumers’ decision before they buy an electronic item is value for money, which includes factors such as price, quality and performance. Electronic waste is a major issue to e-waste factories and people who lives around those factories, but it has NOT been a major issue in creative industries. The main page of most creative industries websites consists of all the relevant information that consumers have to know including, the price, model and product specification. However, the main page contains limited information about the company being responsible of their products at the end of the product life-cycle. Consumers who are environmental friendly will need to search for the ‘Corporate Responsibility’ link in order for them to gain more information about how the company is responsible for their products at the end of its life cycle. As a result, very few consumers would search for such icon and this reflects that not many consumers care about e-waste. Regarding Apple’s website (as shown in Picture 3), there is an icon that links consumers to view the Apple Recycling Programme, which describes the possible ways that consumers can do in order to recycle different parts of Apple products. 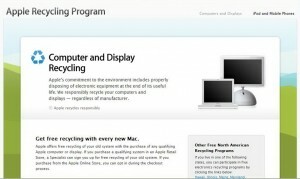 For example, consumers can bring Apple batteries back to any of the Apple’s shop and it will be recycled for free. This shows that the company is trying to be responsible for its products when the products have reached the end of their life- cycle. 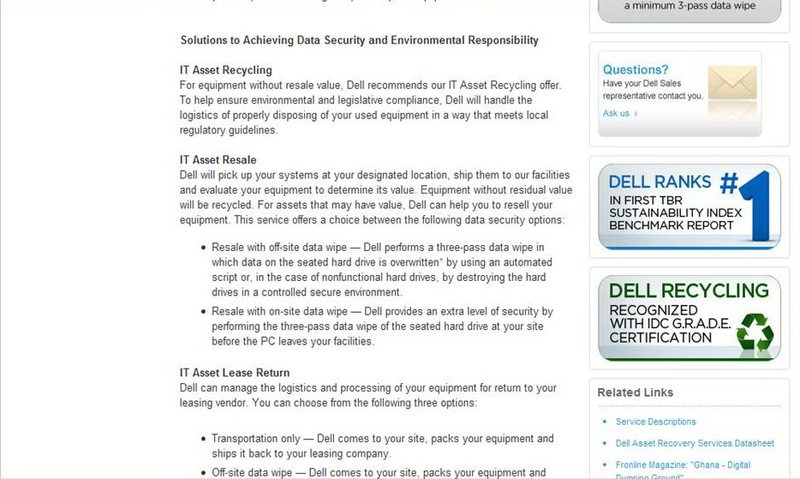 On the other hand, Dell’s website had announced general information about being responsible with their products (Picture 4). 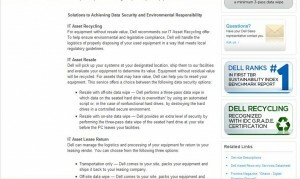 However, there is no specific information on what consumers could do in order to recycle Dell’s products. Regarding the interviews with one of the 2nd hand electronics shops (2010), the researchers found out that individual consumer gets rid of their electronic items by selling them to the local junk man. Then the junk man will sell them electronic components to local wholesaler for them to deal with. If the shop receives any electronic items from the junk man, they would try to repair them and sell them as 2nd hand products. If the item reached the end of its life-cycle, they would separate the components into parts which could be sold for money and those parts which could be recycled. The price of components would depend on the market. There would be trucks from Taizhou and Guangzhou coming to collect the items. These two cities contain the major recycling factories in China. Improper ways of dealing with electronics could cause adverse environmental problems such as pollution and production of toxic air in the environment (Tong and Wang, 2004). Therefore, the researchers asked the staff whether there are environmental regulations in the e-waste recycling industries and they said there are regulations which large factories have to meet. In terms of labour working conditions, they are aware of the way e-waste recycling factories deal with its e-waste having impact on workers’ health but they did not mention about any specific health issues. At the end, the researchers were told that no one really cares about how much profit they make in the business or whether they are dealing with the impact of e-waste on the environment and workers’ health. As long as money could be earned, the business continues. The researchers concluded that due to the rapid innovations of electronics, the price of 1st hand electronics have dropped dramatically. If electronics are bought for personal use, consumers will choose to buy 1st hand products as the price difference between 1st hand and 2nd hand is not much. Therefore, refurbishing and reusing 2nd hand electronics is being environmental friendly but if 2nd hand electronics are sold at inappropriate prices, then 2nd hand products will eventually be another category of e-waste. In short, creative industries are the initial cause of e-waste. Creative industries have produced items which caused environmental problems for recycling factories to deal with them. Because electronics are things which consumers have to buy and use, there is nothing much that a consumer can do to influence the production (said by one of the electronic consumers). Therefore, as e-waste has not been a major issue to creative industries and consumers, the responsibility of managing e-waste is left to the e-waste recycling factories. Part 3: Why Importation of Electronic Waste Still Exist in China? 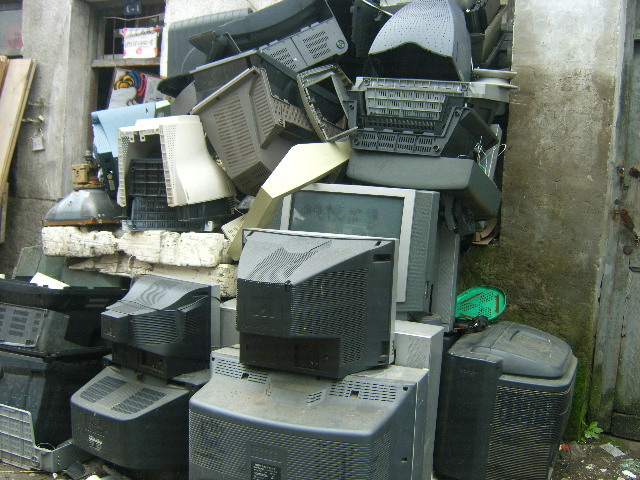 Soft logistics regulation is another cause of the continuous existence of importation of e-waste. Rossiter (2009) defined logistics as “the management of global supply chains and labour regimes”. This could include any software used to manage, control or input container information, keeping track on the containers and any performance measurement software that measure workers’ actual working hours and workers’ work performance. Rossiter (2009) further questioned the failure of databases on the logistics containers information that still allows e-waste to be shipped into China even though it is illegal to import e-waste. This is because people involved in the shipment have successfully ‘disguised metal scrap and electronics products’ (Tong and Wang, 2004, 641). They have estimated that 700,000 tons of e-waste was imported through the Yangtze River delta in Beijing Zhongse Institute of Secondary Metals (2002). However, the methods used to estimate the amount of e-waste is not compatible among countries (Terazono et al, 2006). Therefore, there is a problem in relying on the e-waste figures. Recycling factories deal with unwanted steel, copper and unwanted semi-deconstructed metal waste (Wu, 2010). However, small amounts of e-waste are hidden in containers which came from aboard and this does not cause problems in passing through custom, but sometimes they are forfeit (said by one of the recycling factories). This means that there have not been full inspections on containers entering into China and exporters have not been declaring honestly about what they are exporting to China. Therefore, due to soft logistics regulations, there has been continuous existence of the importation of e-waste into China. Part 4: Discussion – Should Importing of Electronics Waste be Illegal in China? Importation of e-waste into China has both positive and negative sides. Part 4.1 argues that if importing e-waste into China is made legal, the importation will bring benefits to individuals and China. Part 4.2 reflects that because dealing with e-waste can cause environmental issues and health problems, the importation of e-waste into China should be illegal. Due to the amount of land, space and workforce that China has, many companies have outsourced their electronic products to China for production and therefore, many items have been labeled ‘Made in China’. As China has taken the responsibility of the production stage, it should also take the responsibility of dealing with the recycling stage. Also, the 2008/09 world economic crisis had impacted the recycling market adversely and therefore many Chinese people ended up being unemployed. Importation of e-waste should be legal due to the following reason. Importing e-waste will give working class people employment opportunities to work in the e-waste factories (Terazono et al, 2006). In terms of individual benefits, people will have their own incomes and savings, which can help to pay their debts and resolve their poverty issues. In terms of the whole country’s benefits, the unemployment rate would be reduced. This essay assumes that developed countries are waiting to export e-waste to China as it offers a reasonable price. With a large workforce being unemployed, if importing e-waste is made legal in China, the unemployment rate would decline and the economy is likely to grow further. 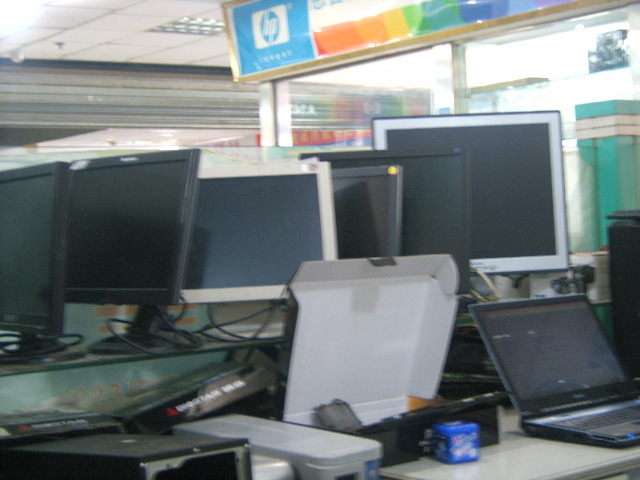 By importing unwanted electronic items, Chinese people could gain consumption benefit (as found out from the fieldtrip). In other words, e-waste in other countries is money for China. 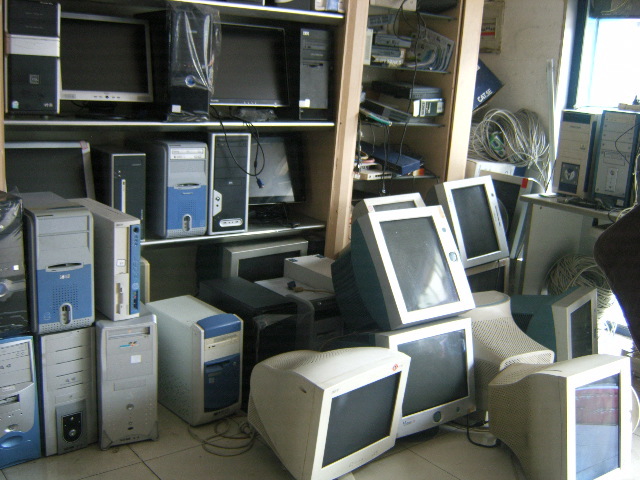 Wu (2009) reported that there are illegal e-waste factories in Shanghai to refurnish the imported e-waste and sell them as 2nd hand electronics. This means that the imported electronics could be reused in China but it must be sold at a reasonable price. If this system is managed and controlled effectively, it will be an environmental benefit to the whole world as well. Picture 7: E-waste or 2nd hand electronics? In short, if China imports e-waste from other countries, it could bring benefits to individuals and the Chinese economy. However the effectiveness of dealing with electronic waste would highly depend on the level of strictness. As being environmental friendly is costly (according to Wu (2009) equipments to treat e-waste could cost as much as 15 million RMB per company), electronic producers and e-waste recycling factories would not take this issue into consideration. Even though dealing with imported e-waste brings benefits to the Chinese people and the Chinese economy, however, if they are not dealt with in appropriate ways, the ‘contamination of electronic production’ (Zehle, 2008) could cause problems as explained below. Chan (2009) proposed that the three major issues of labour condition in e-waste industries are: job security, the use of contingent labour, and the fair and fixed-term labour contracts. These include the danger of the working environment, hiring child labour and unpaid overtime work. According to Maxwell and Miller (2008), the process of e-waste recycling in China has adverse impacts on the environment, human health and human safety because materials such as plastics and metals contain cadmium and mercury could affect the biological development of children. In additional to Maxwell’ and Miller’s (2008) opinions, if e-waste recycling factories still do not pay immediate attention to the basic protection against toxic metals and if it does not care about the workers’ lives, other countries should continue to stop exporting e-waste to China. Rossiter (2009) appreciates that improving labour conditions could cost the company a lot of money. As a result, improving labour conditions is a cost to the company while it is a benefit to many workers. In order to raise the standard of working conditions, solving the health and safety issues of e-waste factories, the government play a significant role in collaborating with the electronics producers and e-waste recycling companies. Improper ways of dealing with e-waste not only result in significant negative effects on the workers’ health and people living around e-waste recycling factories, but it also affect the environment (Tong and Wang, 2004). For example, the burning of plastics components or other non-recyclable materials sends toxic gas into the air (Tong and Wang, 2004). This damages the environment and affects both workers’ health and the surrounding residents. As there is no proper control in the e-waste industry (Terazono et al, 2006), there is no reliable methods to obtain the data on the quantity of e-waste being imported or the quantity of e-waste China produced locally (Maxwell and Miller, 2008). Therefore, it is difficult to convince people on the adverse impact that e-waste is harming on the Chinese environment. In short, due to the inappropriate technologies and ineffective ways of dealing with e-waste in China, many people’s health and the environment are affected by the impact of e-waste. Therefore, the importation of e-waste in China should be illegal in order to maintain or limit the quantity of e-waste in the country so that the impact does not rise. Should importing of electronics waste be illegal in China? The answer is the importing of e-waste should still continue to be illegal in China. Furthermore, there should be stricter control in customs so that the quantity of e-waste in China will not rise. With this policy, environmental issues and people’s health problems will not be on the increase. However, if a stricter policy is enacted resulting in little of no e-waste entering China through imports, as a consequence, many workers who work in the e-waste industry will find themselves without jobs. Even though e-waste recycling factories have been using improved technologies and have intensive management, the government could still further mitigate environmental issues (Chen et al, 2010, 366). Firstly, there should be deeper collaboration between government, producers, consumers and recycling factories. For example, when consumers want to recycle their unwanted electronic items, the government has to ensure that there are recycling facilities available for people to do so (suggested by an electronic consumer). If not, consumers might just put the electronic items into an ordinary bin and it would be mix with other items, which makes it less likely to be identified as e-waste later. Secondly, as the initial cause of e-waste issue comes from creative industries, the government should increase incentives for producers to change the earliest stage of material flow (Tong and Wang, 2004). ‘Corporate Responsibility’ increases brand recognition and reputation of the company. Producers should take responsibility for the products which have reached the end of the life expectancy in order for their brands to have better reputation. Moreover, the government should educate consumers about the concerns of e-waste to increase the people’s awareness. This communication could be done through media by showing the possible impacts and environmental transformation (Zehle, 2008). Thirdly, the government could subsidise creative products’ materials and use materials which are less harmful to the environment (Wu, 2009), because most producers find it challenging to accept the additional of financial issues for disposing their end-of-life products (Tong and Wang, 2004). Lastly, this essay would like to suggest that only if the Chinese government could regulate and manage the domestic e-waste in China, then it should change the regulation for the country to be able to import e-waste legally from other countries in order to increase employment and consumers benefiting from gaining 2nd hand products as stated in Part 4.1. Chan, Jenny and Ho, Charles (2008) The Dark Side of Cyberspace: Inside the Sweatshops of China’s Computer Hardware Production, Berlin: World Economy, Ecology and Development (WEED). Chan, Jenny (2009) ‘Meaningful Progress or Illusory Reform? Analysing China’s Labour Contract Law’, New Labour Forum 18 (2): 43 – 51. Chen et al (2010) ‘Study on adverse impact of e-waste disassembly on surface sedium in East China by chemical analysis and bioassays’, J Soil Sediments 10: 359 – 367. Davis, Mike (2008) ‘Who Will Build the Ark? The Utopian Imperative in an Age of Catastrophe’, Brecht Forum. Dwivedy, Maheshwar and Mittal, R.K (2010) ‘Estimation of future outflows of e-waste in India’, Waste Management 30: 483 – 491. Greenpeace (2008) Chemical Contamination at E-waste Recycling and Disposal Sites in Accra and Korforidua, Ghana. Levin, Dan (2009) ‘China’s Big Recycling Market Is Sagging’, The New York Times, 11 March. Maxwell, Richard and Miller, Toby (2008a) ‘Creative Industries or Wasteful Ones?’, Urban China 33: 28-29. Maxwell, Richard and Miller, Toby (2008b) ‘Ecological Ethics and Media Technology’, International Journal of Communication 2: 331-353. Martinez-Alier, Joan (2000) ‘Environmental Justice, Sustainability and Valuation’, Harvard Seminar on Sustainability. UNEP-Vital-Graphics (2004) Vital Waste Graphics. E-Waste: The Great E-waste Recycling Debate, October. Rossiter, Ned (2009) ‘Translating the Indifference of Communication: Electronic Waste, Migrant Labour and the Informational Sovereignty of Logistics in China’, International Review of Information Ethics 11. Terazono et al (2006) ‘Current status and research on E-waste issues in Asia’, J Mater Cycles Waste Manage 8: 1-12. Tong, Xin and Wang, Jici (2004) ‘Transnational Flows of E-waste and Spatial Patterns of Recycling in China’, Eurasian Geography and Economics 8: 608 -621. Waldmeir, Patti (2010) ‘China’s Irregular Recyclers Face Scrapheap’, Financial Times, 15 March. Wu Jiayin (2009) ‘The Junk Man Cometh: But He Won’t Recycle’, Shanghai Daily, 16 February. Zehle, Soenke (2008) ‘Network Ecologies: Documenting Depletion, Exhausting Exposure’, Urban China 33: 30-31. Creative Industries and Real Estate are normally promoted as ‘clean industries’ without the perception of pollution. However, it’s not the whole story when people within the industries showing indifference to the environment and lack of proper actions to prevent pollution, it turns out to be toxic. As Maxell and his colleagues inspire, the ‘clean’ industries can be the wasteful ones for people rely on electronic products too much which can produce toxic e-waste (Maxell, 2008a). In a following fieldwork on the relationship between the creative industries/real- estate clusters and pollution in Ningbo, the Urban-Media Network team from University of Nottingham Ningbo, China, well observed another new form of pollution in the field-Soil Contamination. Soil contamination caused by decommissioned factories sites are rarely known neither by public nor government in China. The sites have been widely reused in most cities in china in answering to the hot demand of land in the progress of the urbanization. Yet, the risk of contamination land has seldom been noticed and analyzed that the so called clean industries thus turn out to produce toxic clusters. Being more invisible by comparing to other pollutions such as water pollution or air pollution, this form of pollution can cause severe damage by hiding deeply under the land. The hidden polluted soil normally poses serious health and safety risks to people the environment. More seriously, some of the contaminated land might keep do harming decades even after the polluted source is moved away. Thus the bell ring for the whole society while people enjoy the creatively reuse of the suspicious abandoned factories sites. This paper starts by raising a new question of soil pollution caused by the abandoned factories reused for creative industries and residential areas. Then by showing the link between theses ‘clean’ industries and toxic effect it can cause, cases in Ningbo and other cities in China are well demonstrating the severe risks of this hidden harm. Interviews of people with different background such as government officials from various departments, developers and environmental protection specialists also add value to the research. It’s then followed by an emerging call to solutions and actions. This research serves as an initial attempt to increase awareness and to inspire possible strategy rather than providing detail solution for it’s not always determined by the ‘clean’ industries itself towards a better environment but the attitudes and actions taken by people within it. 2. Creative Industries is not clean: how clean industries turn out to be poisonous? In the demand for urban development, China is facing steely stress in land supply in urban areas. Removing the polluted factories out of the town which are then replaced by new ‘clean’ clusters becomes a direct and easy way to solve the problem. Taking Nanjing for example, 219 polluted factories including Nanjing Chemical Plant, Nanjing Chemical Fibber Plant, Nanjing Titanium Dioxide Plant and Nanjing No.2 Steelworks have been relocated from the down town city during 1992-2006 (Public China, 2006). However, this first trend of reusing the contaminated land is really risky due to the weakness of soil government. According to an official from Environmental Protection Department, the soil contamination “does exist after the removal of polluted factories, however, this issue is now out of effective government’ (Public China, 2006). What does the official mean by ‘out of effective government’? 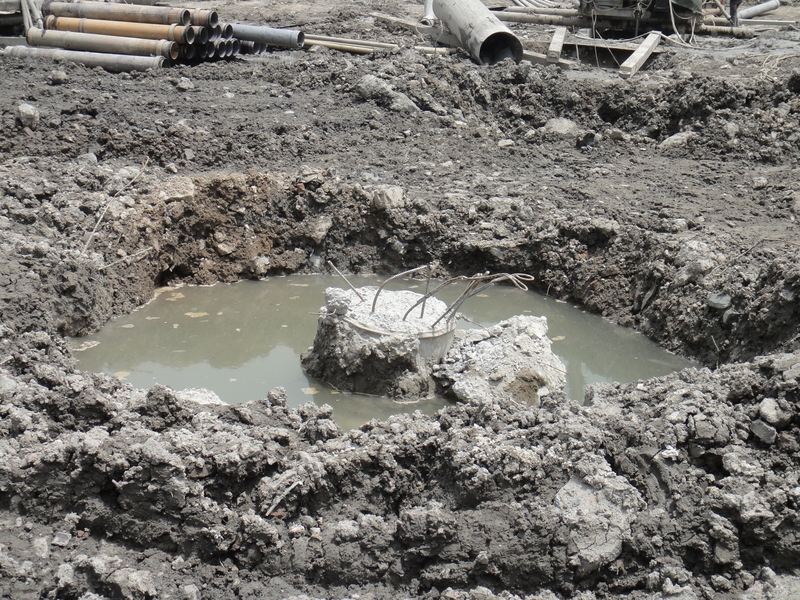 Some facts show it’s a genuine landmine rather than an innovation of land reuse. Who should pay under the present administration of Chinese soil issues? The former land owner? The Land and Resource Bureau? or the new developers? And base on what? The unclear responsibility in Chinese practise makes it tough in promoting the world-wide accepted ‘Polluter Pays Principle (PPP) in dealing soil pollution. According to PPP, it requires the polluter pay for relevant prevention and control. This principle is a ‘generally recognized principle of International Environmental Law, and it is a fundamental principle of environmental policy of both the Organisation for Economic Co-operation and Development (OECD) and the European Community.’ (TEE Website, 1969). In theory, China today follows the principle in making policies on pollution prevention. However, there are some obstacles in chasing the polluters to pay during the swap of land ownership. One of the most important reasons is there is no a specific environmental requirement for the polluters to pay for the treatment before they move from the previous sites. As China experiences a boom in the urban construction from the past 20 years, many decommissioned sites have been reused without any inspection in regarding to the soil contamination. Therefore, it becomes a tough task in promoting the PPP today years after the contamination happen for most of the polluted factories removed out of the sites are those without good financial results and most of them are broken. Even there is strong evidence that they cause pollution, they are not affordable for costly soil cleaning. For those survival ones who might be cable to the cost have a sound reason to refuse-there is no law in requiring them to be responsible. This leads to a review of the history of Law of Soil Prevention making. 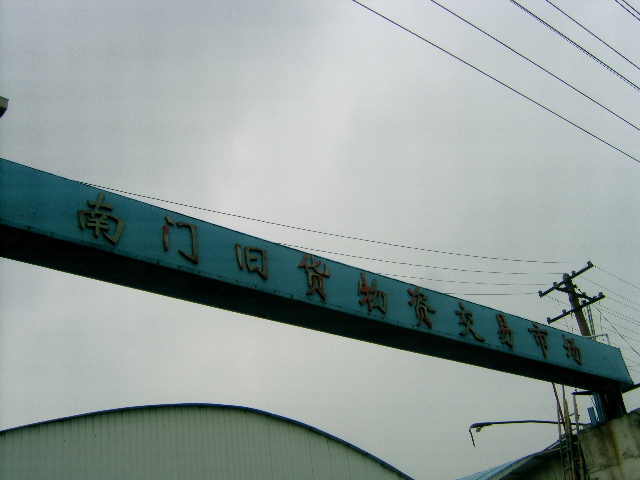 In China, according to Zhu (2010), there is no legal requirement for those factories to pay extract money if their operation is within the regulation of current environmental policies. Of course they haven’t broken the law for there is no law there actually. This strange logic helps many polluters who produce genuine pollutant escaping from the responsibility and legal punishment. Then, the decision maker must pay for it. The Land and Resource Bureau (LRB) as mentioned is the government department who is in charge of land management. According to an interview to Xu SL (Xu, 2010), a retired officer from The Land and Resource Bureau , he said he never knows there is any requirement for land cleaning before the land transfer in his careen of 20 years in the department. The situation might change from Jan 2010 for the lesson LRB learnt in Wuhan. 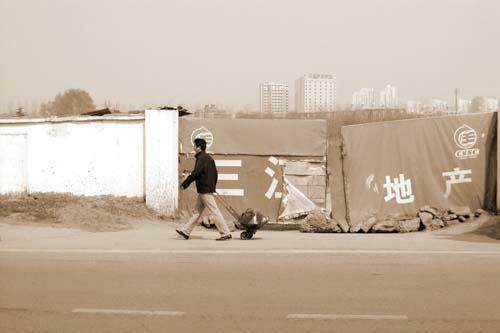 In a worksite accident that 3 workers severely injured due to the exposure to the soil, the developer found that the golden land it wins in a bid turns out to be toxic by soil pollution, the developer returned the land back to the government–Wuhan Land and Source Bureau who lost 12 million Chinese Yuan in the case (The Ifeng website, 2010). It might be the first story in public media that the government pay for its legal leak in contaminated land transfer which is believed to start some thoughts on reforms in soil controlling all over the countries. However it’s not always the government pay during the game of land transfer. In Ningbo, one high-end residential area has been built in decommissioned pharmaceutical factories that it was later found the soil is polluted and received a call for cleaning. Interestingly enough, neither the polluter nor the LRB pay for the land treatment, but the developer. In an interview to another developer in the town, Xu (2010) said the imbalance between land supply and demand makes the developer into a dilemma that one eager to win out of other competes often the times loose the power in bargaining or to be specific speaking, the developers have no power to ask the government to compensate for the mistakes made by someone else. In this case, 8 million for the first cleaning is paid by the developer. This is easily linked with a question that why the Wuhan Developer who successfully return the land back to the government while the Ningbo one failed to. It’s simple, because the cleaning is far more expensive and out of the developer’s budget in Wuhan. More importantly, it’s known to world by media reports at that time. Consumers have sound reasons to require more ethics and responsibility from developers for consumer power is the weapon once the right are well recognized. Environmental Standard = Soil Standard for Human Living? 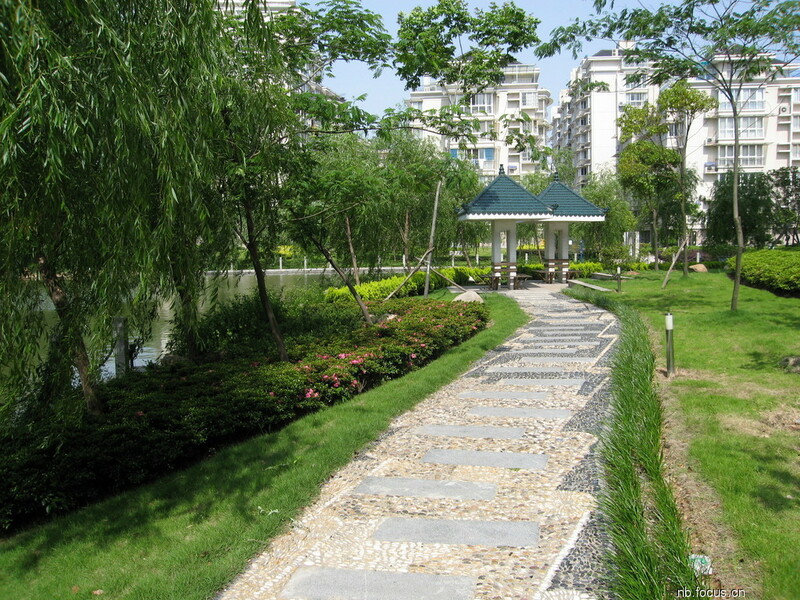 In the interview to Zhu (2010), an official of Ningbo Environmental Protection Bureau, there is a requirement for developers to pass an Environmental Evaluation Check (EEP) before any project starts. However, the evaluation is only regarding to a comparatively rough reference in environmental influence which doesn’t cover specific reference such as main heavy metals which contributed to most of soil contamination. Then if there is any reference in specifying soil standard for human health in the living environments, he answered: “we have no such kind of policy and it should be business of the Health’s Department”. Does a relevant health standard exist? It’s clearly answered by supported by Jin: “The health department has no such kind of standard (Jin, 2010). Instead, projects are supposed to be harmful less once they get the approval from the Environmental Protection Bureau.”(Jin, 2010) This makes the basic right of safety for residence or investors on the clusters unprotected in most cities in China. The case of Oriental Venice, one of the high-end residential areas in Ningbo, tells the damage can happen everywhere in the City every day. Thu is discovered in the soil which resulted from improper soil cleaning by the former chemical factories (Oriental Venice Community, 2005). The discovery makes every people living in the community facing a great threat that Thu can lead to severe illness such as lung cancer. The local Environmental Protection Bureau then involve into the inspection and with a controversial result that the metal is quite few which might do no harm to human being after the polluted soil is removed. This report is not acceptable by most of the residences for they question the method the EPB uses to test the polluted area and the long-term affect Thu might cause due to those soil hidden deep under the so-called cleaned surface. The worry has sound reasons for there is no accurate standard for human health to support the saying by EPB and who can tell exactly if there is no more Thu radiation which might still affect the soil, air and water in the future. This won’t be the solo in the progress of urbanization until more people are involved in the fight to soil contamination. The management of soil pollution are therefore very weak in China. Measures should be immediately taken to stop the evil becoming worse which include public education, engagement of civil society and consumer powers, and ethical requirement for developers, law improvement, health standard setting, financial support and relevant technology. Campaigns on public and government education will play a primary role in raising this new and unbeknown question into views of public. As it’s well illustrated that few people including government officials or common citizen have less knowledge towards the pollution, the education will drive more people from different levels to face and solve the problems in the near future. This strategy is a critical force from bottom up and has a close link with the consumer powers that becomes the main force to fight for their basic right of health and safety from the government and developers. This will then push the developers to join the ally no matter on their considering of the cost of the business or its reputation. Then the government is thus become the target who should take immediate actions and responsibility to deal with the pollution and to prevent further harm. While the strategy of education is an effective way to draw attention to the issue, law making on soil pollution is the key measure to provide legal protection for future cases. According to some developed countries such as US, Australia and Holland, relevant laws have been well established. For example, US have its Soil Prevention Law in 1980. Although China starts to think of the legal improvement on soil government, according to the expert: “ The initial soil contamination law would not include specific provisions on liability or responsibility for paying for soil remediation…the law would include guidelines on risk assessment and soil remediation, as well as investigation methods and management of contaminated sites(The BNA Website, 2010). It’s thus a long way for China to go before the law is well established. However, pollution can’t wait. Another key issue in the improvement is the setup of standards regarding soil both from Environmental Protection Bureau and Health Bureau as in China the former is in charge of environmental protection while the later is for human health issues. Thus, soil pollution has put the protection of ecology system and the health of human together that requires the coordination and a closer team work between the two departments in the future. According to Jin (2010), the success of the collaboration relies in the removal of bureaucracy among different government departments and a common consensus that avoid each does things in its own way. Funding and Insurance can also contribute to the soil contamination solution from the financial aspects. Treating soil pollution, according to Xu (2008), is costly and more worryingly, some contamination is hard to clean completely. As Zhu argues (Zhu, 2010), some cities under developed and without sufficient financial support might make the way to land treatment tougher. The process of soil cleaning thus needs enough money to support. Special funds will be helpful in the case. In addition, the model of Insurance on soil pollution in other countries can be borrowed by the polluters to carry out contamination cleaning when the pollution inevitably happens. Developments of soil cleaning industries and soil treating methods will decide the progress of soil pollution from technological aspects. In China, it’s a brand new market opportunity that requires sufficient expertise and technology to support. In some developed countries, the soil cleaning takes up high to 30-50% of the share of the whole environmental protection industries (The Wateruu Website, 2010). The new market will attract more foreign companies with rich soil treatment experience entering China. This might be the good news. This paper serves as the first attempt to raise the new question of soil pollution in Ningbo and other cities in China by showing some facts and proposing possible solutions. However, it’s narrowed by the sufficient source of data on soil background survey in Ningbo due to rare research and studies are made in this new phenomenon. It thus opens the door to further researches on mapping of how many polluted factories in Ningbo have been reused under the threat of soil contamination, on the accurate affect by the pollution, and professional solutions that help to prevent further damage in the future. This paper is inspired by article Creative Industries or Wasteful Ones (Maxwell, 2010) which reveals the ‘clean’ industries might bring disaster to the world. A further research on the link between the industries and pollution in Ningbo observes soil contamination as a new form of pollution in the creative industries and real-estate clusters. Soil pollution becomes emerging for the pollution is hidden and its affect can be long-term and fatal. The situation becomes more severe in Ningbo and other cities in China for few people now notice existence of the pollution and less report on it. Education, Law and Policies, Funding and Civil campaigns should be all involved to take immediate actions for reduction and prevention of the pollution. As a new noticed form of damage in the progress of urbanization, soil pollution on creative industries and real estate clusters calls people’s strong awareness and proper actions towards the environment we rely on. Forget the label of Green it once have for things should be follow the logic that no clean environment, no clean industries. The bell tolls! Jin, WL. (2010), Interview, 24th May, 2010. A big Chinese character “chai” (plan to be demolished) marked on the wall of the ruins, the gone bulldozer leaving a cloudy of dust behind; one and another aged building crashed to the ground in second, these pictures are frequent to be seen in the contemporary China. However, it seems that some old plants are lucky to survive from the destiny of demolition. Given the rise of the creative industries and the influential practices in the western countries, Chinese government learned from the profound strategies to urban development and started driving on the creative industries in the name of protecting and revaluing the heritage of the historic manufacture time. The concept of the creative industries was initially introduced and highly promoted in UK from 1990s. It is a type of industries identified with the transfer to knowledge economy and the generation of creativity-based high value-added products and services. Although, UK is the first one raising the concept of creative industries, the orinigal artist community or more appropriately the sample artist creative cluster could be traced back to 1960s in America, for instance, SOHO region (Zukin 1989). The historic transformation of SOHO region presented an accidental outcome of stimulating the real estate market by its LOFT workshop and lifestyle bringing about the culture consumption by the middle-class (ibid). The same byproduct effect could be found in Beijing 798 art district as well (Berghuis 2008). “…investment in ‘creative clusters’ effectively functions to encourage a corresponding boom in adjacent real estate markets. Here lies perhaps the core truth of the creative industries: the creative industries are a service industry, one in which state investment in ‘high culture’ shifts to a form of welfarism for property developers.”(Rossiter et al 2006: 242). This essay will investigate the relation intertwined between creative industries, urban space production, and real estate industries. Starting with relevant literature reviews, a closer look will be shed on the discourse of creative cluster, and deconstruct the creative cluster to two parts through more thoughtful interpretation. Then it will question a major problem within the creative cluster on its intensified interest in geographical location or physical property dimension. In final, the main argument will be explained through the field work in Ningbo account and the core fact is that, through adopting the creative industries strategy, local government, and urban planners join force with the land developers and the capital investors to start another round of urban renewal. As noted before, the creative industries was initially introduced in the early 1990s, identified as a new information besed economy. According to the report issued by Creative Industries Task Force (DCMS 2001:4), the creative industries is defined as “activities which have their origin in individual creativity, skills and talent, and which have the potential for wealth and job creation through generation and exploitation of intellectual property.” Along with the rapid development of Internet and media technologies and its global proliferation started in the same period, it lit up the universal enthusiasm for this new type industry (Flew 2009). Moreover, its low costs of production for one hand makes more competitive; on the other hand, it brings local industries moving upwards in the global value chain. The connections between the rise of the creative industries and the development of cities were later drawn into the discussion. In the 1979s and 1980s, the cities in most western countries were suffering from the decline of manufacturing industries and encountering a bottleneck of development (Flew 2009:85). With the emergence of the creative industries, urban planners grasped the opportunities to using information economy as urban renewal strategies, highlighting the culture and creativity as a powerful means to revitalize and modernize parts of its urban economy. Meanwhile, many scholars joined to back up the cooperation between the creative industries and the urban regeneration. Scott (2008, see in Flew 2010) related the rise of creative economy to the resurgence of cities. And other scholar like Landry (2000) termed the cities as the hard infrastructure of creative industries, able to provide sufficient facilitates and relevant service network as well. 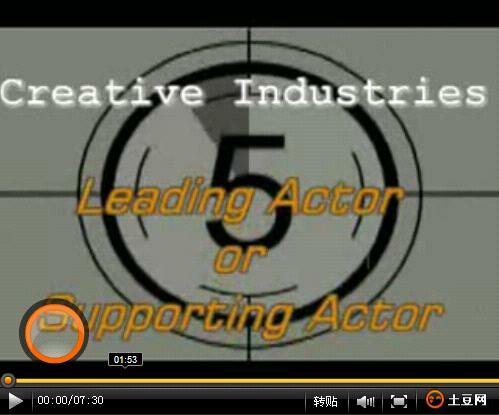 In late 2004, the concept of the creative industries arrived in mainland China. It was firstly adopted into practices by the cities like Shanghai and Beijing (Keane 2009a). Later on, the creative industries were officially put on the agenda in the 11th Five Year Plan from 2005 by PRC government (Rossiter 2008). An important goal is the ambition to switch the current China reality of ‘Made in China’ to ‘Create in China’, and thus to move higher up the value chain from the bottom position to upward (ibid). Since then, to accordingly promote creative economy, the officials, scholars, practitioners, entrepreneurs and developers have exploited the idea of creative industries and a range of Creative Cluster, Creative Harbor, Innovation Park and High-Tech Zone were springing up like mushroom largely in the mainland China. In one of Keane’s reports, the author has done some ground investigation of creative clusters in Suzhou and Foshan. The purpose was to look into the underlying constraints within China’s creative economy (Keane 2009b). He argues that the example accounts and the vast majority of data together draw a conclusion that China’s creative industries are fundamentally misunderstood in China and more appropriately the cultural industries. By adopting the mode of cultural industries, it drives local urban development and increases land values conspiratorially (ibid). When the manufacturing industries moved out from the downtown city, those plant sites and retired buildings had to encounter an uneasy fate. Urban renewal project set up a target for new modern appearances instead of old historic ruins. As a result, many old industrial buildings of the city could only keep their memories into the city museum archives. After years’ urban development, a result is that China has received a bad reputation for destroying its historical roots as well as demolishing every old building. Noticing that the rapid development of the creative industries in the western countries, gradually the urban planners realize that rather than absolute demolition it is possible to effectively repackage those old industrial buildings into the creative industries clusters, so as to rekindle the vitality of the original site and receive the same outcome as the former way of demolition. Soon, local governments and urban planners joining force with the land developers and the capital investors start another round of urban renewal through adopting the creative industries strategies. Pasquinelli revisits David Harvey’s work of The Art of Rent (Harvey 2001), claiming that “all the immaterial economies have a material, parallel counterpart where the big money is exchanged” (2006:22). The mode of value generation in creative industries domain is in fact not limited to the exploitation of intellectual property, but also a more tendentious way of parasitic exploitation by another material objects. The discourse “collective symbolic capital” introduced by Harvey unveils the potential political economy of cultural interventions and the parasite exploiting the social creativity. The culture context provides the marks of distinction which be exploited further by capitalists to sell material goods. Pasquinelli states that the production of culture as social capital and real estate speculation is a couple of immaterial and material compound (ibid). Therefore, inspired by Pasquinelli’s argument, we try to decode the discourse of the creative industries into two parts: the culture and creativity as immaterial part; the clustered territory as material part. Firstly, we draw on one of its subordinated elements: the culture and creativity. In his book The Rise of Creative Class, Richard Florida argued that “Creativity has come to be the most highly prized commodity in our economy” (2002:5). It also introduces a newly emerged social class as the “Creative Class” referring to those both being the source of “Creativity” in the rise of Creative Industries and contributing to the consumption for generating the economic growth in the cities; it seems a positive and productive circle. So, Florida argues that city’s economic prosperity and cultural attractiveness would increasingly depend on how the “Creative Class” is attracted and kept by the local strategies (ibid). Another key element is concerning the cluster phenomenon. It is noted that the first interest to promote a cluster mode can be dated back to late 19th century. A British economist Alfred Marshall suggested the positive outcomes by clustering the related firms and industries to build a value chain (See in Flew 2010). Then in one decade later, another theorist Michael Porter put into effort to readdress the benefits of cluster as a business management mode (ibid). Porter (1998) analyzed the cluster mode would bring about at least three competitive advantages to the involved industries, namely productivity gains, innovation opportunities, and new business formation. The first advantage refers to specialist inputs and skilled labor, enabling to promote the professional reputation and strengthen the collective power. The second one of innovation opportunities is focusing on the interaction with buyers and suppliers by emerging a present and compact value chain. The third one of new business formation is derived from better access to resource, such as venture capitalist, skilled workforce (See in Flew 2010:86-87). This notable cluster theory encourages the model of cluster spreading around. As noted earlier, other conceptual literatures have shed the light on spatial agglomeration and confirmed its capability to smooth the flexibility of information flows, interactive network and relation ties among the diverse but relevant industries (Scott et al 2001). Taking account of above cluster characteristics, the urban policy makers in the stage of postindustrial cities began to combine the culture-led urban regeneration and the cluster mode (Schuster 2002). Practical cases like Hollywood and Silicon Valley demonstrate well the application of creative cluster theory. Except the initial startup in western countries, it also seems to find an even consistent role in countries like China where a collectivist ethos has long been cultivated by the state ideologies (Keane 2009a). Summarized by Borg, Tuijl and Costa in their working report of creative industries in relation with Beijing urban development experience, there are at least two types of creative clusters: artists creative clusters and commercial creative clusters (2010:6). The artists creative clusters appear and grow ‘spontaneously’ by initiatives of artists who concentrate in a certain area to benefit from shared specialized field and inspiring artist environment. Differently, the commercial creative clusters are driven by real estate speculations and are much more planned, focusing on commercial spin-offs of art and culture. However, to name the representatives of the both, the artist creative cluster could refer to the original 798 art district; another type again could refer to 798 art district but in a later phase. In the same report, it records that through the transformation from artist creative cluster to commercial creative cluster, the most conspicuous difference is the growth of real estate price. Furthermore, the increasingly energetic commercial activities have also a profound effect in the form of rising rents. Some of the artists can’t afford the higher rents and have to move out of the area (ibid). The familiar argument could be seen from Berghuis’ account of Dashanzi art district (2008). He argues that the most fundamental and essential development occurring here is indeed the real estate industry more than a contemporary art cluster Though, the place like Dashanzi district started as an experimental art basement of artists’ initiative, but it now ends up a trendy cultural cluster and commercial district whose biggest beneficiaries are property dealers. The loser could be the artists who contributed to the reborn of 798 art factory but eventually have to be driven off by the increasingly raised residential rent. In fact, the distinct culture context or creativity brand helps promoting the real estate speculation and generates a compound economy of creative industries and commercial industries (ibid). Following up the topic on the creative industries in relation to urban space production, this section scheduled to reflect forementioned literature thoughts into the performance of Ningbo creative industries in reality. The argument embedded is that the creative industries, for one hand, is a set of economic form, expected to generate economic growth and contribute to labor employment; on the other hand, it is also a tool, used to cover the underneath strategies for coalition between local government, real estate developer and commercial industries. We have chosen three observation sites for field work and systematically picked them up per differentiated phase categories. Phase one means the planning settled down and the project under construction; phase two refers to nearly finished project on a trial run; the phase three suggests the project formally on business. The first observation spot is Hefeng Creative Square, located in the east bank of Yao River. 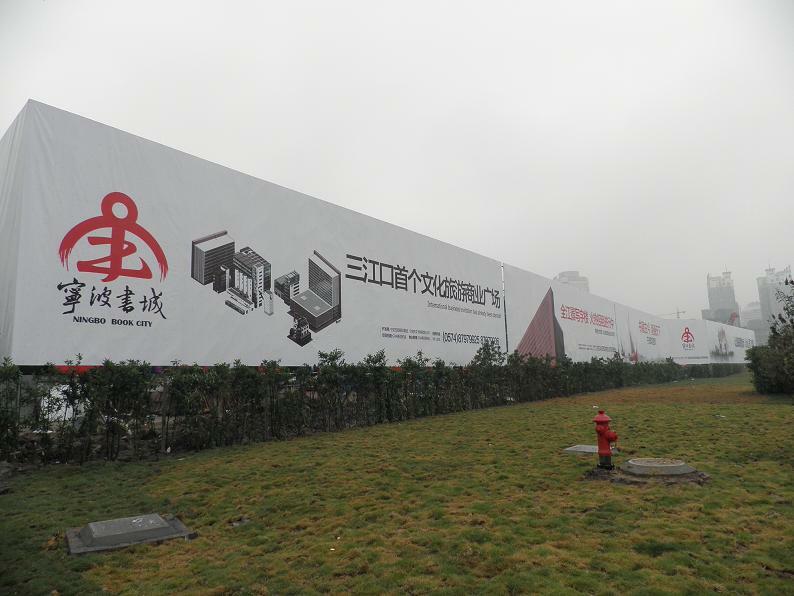 Though only semi-finished architectural complex erects on site, the temporary enclosure wall presents impressive advertisements to attract potential companies and financial investment. Learned from the interview, the ambition of Hefeng is to establish a flagship industry in providing creative and innovative service to plenty manufactories in Ningbo area, not only compete with local service providers, but also those from Shanghai or others, even foreign countries. In regards with the decisive advantage for them to compete with other creative clusters, the interviewee emphasized the professional guide and training provided by cluster committee plus the golden location, the center of downtown Ningbo. The planning map demonstrates the square with a large plot in territory. Moreover, Hefeng creative square is not positioned as a simplex creative cluster, but integrated with commercial-oriented use like restaurants, hotel, shopping centre, and entertainment. The mode refers to the urban planner’s additional proposal that, besides the creative industries, they also conspire to develop real estate industries, commercial industries and tourism industries as well. The second spot is Book City. It is one of key culture and creative projects promoted by Ningbo Government. Situated oppositely to Ningbo Laowaitan, the site was once the flour factory of Ningbo. As same as Hefeng Creative Square, the structure of Book City is weaved as a matrix bonded culture and creative industries with commercial industries. The project of Book City is near to completion, and the key building which is the biggest one just celebrated its opening to public. 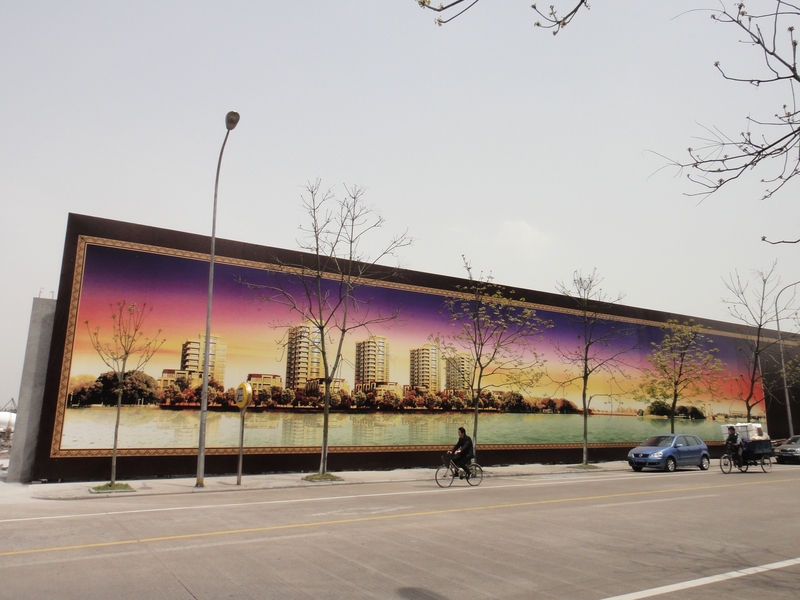 To brand its culture meaning, Book City is titled as “City Reading Room on East Bank of Yong River ” (CNNB 2010); for commercial promotion, it again advertise with “The First Culture, Tourism, and Commercial Plaza on Mouth of Three River” ( Book City Billboard 2010, pic 2). Since it is partially launched on business, we arrived at the site and did some anthropologist investigation. Next to Book City there is one normal-leveled residential community, so most retails around are accordingly small and simple ones including clothing shops, convenient stores and casual eating places. 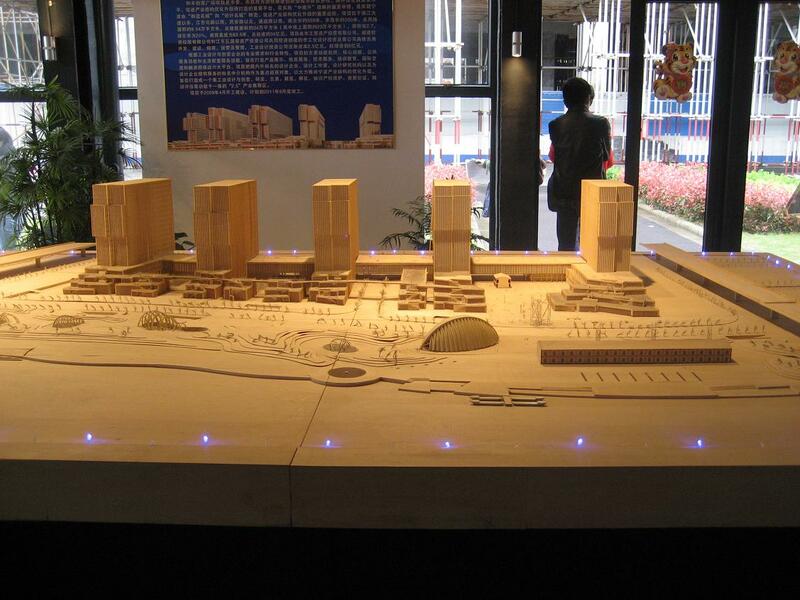 However, the propaganda of Book City promotes that the street beside will be the city’s future culture corridor. The most immediate effect observed on site is that some shops are closed for redecoration (maybe to upgrade); some change the business types. Moreover, we randomly interviewed some shop owners, some of them are optimistic about the benefits bought by Book City, for example, the existing restaurants; some complained the increased rent, such as low priced clothing shops. In the case of Book City, the finding is to some extent the evidence to Keane’s argument that the Chinese experience of Creative Industries is mostly the Culture Industries (2009b). To decode the culture and creativity in a semiotic approach, these old buildings and old plants while transforming to the culture and creative cluster, it has become the visible imaginary symbols of the city culture and social experience. The last observation site is Fortune Creation Harbor situated in the North Bank Fortune Centre near to Ningbo Great Theater. At a first sight of the North Bank Fortune Centre, we noticed that though it covers huge territory with several high-end complexes, some offices seem empty and few pedestrians could be observed on site. When we get close to Fortune Creation Harbor, the situation is exactly the same, some companies removed out, some with no clue or little connection with creative industries. 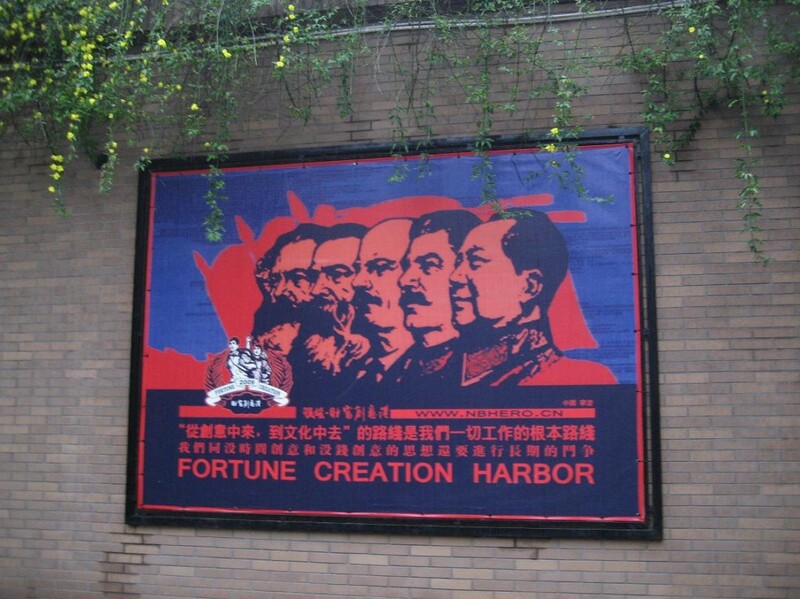 Referencing to the initial design of Fortune Creation Harbor, it was once a key creative industries project promoted aggressively by Jiangbei government. The third picture attached above should have witnessed the prosperity once upon the time. However, two year later, the place shows more deserted and silent. It has failed to live up to the ambitions of their planners. We assume that this concerns much with the planner’s strategies for positioning the place. The basic mode is the same as of Hefeng Creative Square and Book City, to establish a comprehensive industries center, and the aim is to present a perfect package for attraction from real estate speculators and capital investor. Backed up by conspicuous state investments and by fast decision making, the areas have been transformed and neighborhoods have been revitalized, infrastructure has been upgraded. Unfortunately, a great leap forward can not guarantee a long term benefit. In conclusion, to apply the concept of parasitic exploitation of symbolic capital (Pasquinelli 2006), the mode of development of creative clusters in local Ningbo seems a contradictory and conflicted. It confirms the situation of Ningbo’s creative industries that the culture and creative economy-oriented project is possibly exploited mostly by real estate speculators and leave little space for sustainable development of culture and creative reproduction. Using the creative industries as overwrap, and then packaging the commercial oriented industries into creative economics, such a development mode of creative industries was copied by a lot of followers. As in Ningbo area, we’ve observed Loft8, Creation harbor and Creative 3rd plant established one and another designed in similar way. In a first sight, such creative industries may bring instant benefit as it successfully promotes the real estate speculation. However, the more in-depth and profound effect should be questioned and highlighted: how long could this mode of “fake” creative industries further go? Berghuis, T, J(2008), ‘Constructing The Real (E)state of Chinese Contemporary Art: Reflections on 798, in 2004′ , Urban China 33 [Special Issue: ‘Creative China: Counter-Mapping Creative Industries’]. Keane, M 2009b ‘Understanding the creative economy: a tale of two cities clusters’. Creative Industries Journal, 1(3). pp. 211-226. Lovink, G and Rossiter, N (eds) 2006, ‘MyCreativity: Convention on International Creative Industries Research’, MyCreativity Reader: Critique of Creative Industries, Amsterdam: Institute of Network Cultures, pp. 241-247. Pasquinelli, Matteo (2007) ‘ICW-Immaterial Civil War, Prototypes of conflict within cognitive capitalism’, in Geert Lovink and Ned Rossiter (eds) MyCreativity Reader: Critique of Creative Industries, Amsterdam: Institute of Network Cultures, pp. 71-81. Porter, M. 1998. ‘Clusters and the new economics of competition’. Harvard Business Review 76:77–91. Scott, A,J (ed) 2001. ‘Global city-regions’. In Global city-regions: Trends, theory, policy, pp11–30. Oxford: Oxford University Press. Scott, A. J 2008. Social economy of the metropolis: Cognitive-cultural capitalism and the global resurgence of cities. Oxford: Oxford University Press. The documentary covers the interviews which were done with 2nd hand electronic shop and electronic consumers. As many of us own at least 1 electronic item, the documentary enable us, as a consumer, to realise more about the electronic stuff that we are using. The documentary covers the extent to which people are concerned with environmental issues and labour working condition in the electronic waste recycling industry. It looks at the general information about 2nd hand electronic items. It researched on how people deal with their unwanted electronic products. It asked people for suggestions on who do they think is responsible for e-waste and how e-waste management should be improved. Finally, the documentary reviewed the factor that influences people’s decision before they buy electronic products.